Special Ed! I guess, Special Ed! Just when you thought you heard it all there’s more. Everybody knows about the botch-up on the H1 N1 vaccination program in Alberta. Between Ed and his bully-boy health minister Ron Leipert (aided and abetted by his federal cousins who have not come through with enough vaccine), the program is presently shut down for four days and scheduled to reopen Thursday. Contrary to the original plan which was to ensure vaccination of the high risk people first - namely, pregnant women and babies aged six months to five years - Ed opened the flood gates to all. Come one, come all, Ed said, first come, first served. In doing so he followed the advice of his incompetent - and I do really mean INCOMPETENT IN CAPITAL LETTERS - health minister who said that to vaccinate people who were in the high risk category first would be what the Soviet Union would do because the authorities would have to ask for proof that they were in that category. According ot Leipert, that was no system for Alberta to follow. No siree. But it gets worse. Today we heard the astonishing news that none other than the whole Calgary Flames Hockey Club jumped the queue the day before the government suspended the vaccination program. According to a Flames statement it was the Stelmach government’s Alberta Health Services that allowed the pampered stars to get their shots many days ahead of the great unwashed - which include the vast majority of the pregnant women and babies who are in the high risk category. 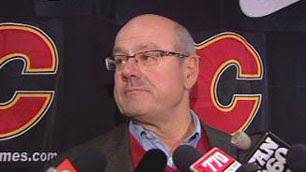 According to Flames President Ken King, 'Our players did not seek to avoid a lineup. They didn't ask for special attention. They followed the direction of our physicians.' Yes, yes, the stars didn’t do it. Somebody on their behalf must have asked the Stelmach government for special attention. Now who could that be? You might remember Ken King during his career as the neocon publisher of the Calgary Herald back when his then employer Conrad Black was learning how to loot companies and enter the House of Lords. Well, because of his outstanding service in advancing Black's ideology in those days King has impeccable Tory connections. As do all of the fat cat owners. Ladies and Gentlemen, this Flames fiasco is what the “Alberta Advantage’ has been all about from the time the term was first introduced by the dumb and dumber crowd of the Klein years. It has always been an advantage only for the privileged establishment. While their incomes and stock portfolios grew and as they built their 10,000 square foot palazzos, the little people had to put up with lousy roads, deteriorating health care, declining education opportunities, and salary levels that just kept their heads above water – barely. The Flames chapter in this sorry saga merely points to a continuing theme in the Klein-Stelmach Tory era – money and power trumps all else. The Flames represent money and power. They jump the queue. To the Tories, nothing gets in the way of money and power - even pregnant women and babies during a swine flu pandemic. This has to be the last straw for Stelmach. If the Tories don’t dump him in Red Deer and try to salvage what’s left of what was once a proud and honorable party, they are doomed, gonzo, kaput! By the way, Special Ed's health officials announced yesterday that the vaccination centers are starting up on Thursday. This time it will only be for kids from six months to five years of age, and by God - just like the Soviet Union - they are going to ask for age identification. And on Friday, a week or so after the coddled Flames got theirs, pregnant women will get their shots. I am not surprise the Tory will protect those "BIG MEN" their friends first, while children and women are lining up on the line waiting for protection and safety. Shame on them. Like my family situation, I am not surprise if they will continue to do anything for their friends: The multimillionaire, the corporation, and the financial industry..... first, while watching my children and I suffering pain and hardship right in front of their eyes...in mist of our family and civil litigation. I finally have enough courage last night to submitted a brief Internet campaign notes to as many Liberal MPs as I can, until I had problem with my computer and decided to stop for now. I observe some controversial debates relating white collar crimes. Some opinions indicating: "It's not a big issue with will make or break the next election". I say that, those Canadians may not be aware of, white collar crimes have a lot to do with corruptions within the financial industries, corporation, & the government. It is difficult to connect, identify, manage, & people tend to accept it as part of life, until it hit us at the very personal level. My family have been one of the victim in the last 4 years, and it took every thing we have earned in our live times with it. On the positive notes, it gave me a strength to cry out loud and come outside to see, learn, and participate how outside world is dealing with the problem at a massive level of human interventions. So far I have receive some initial responds form some of the Federal MP office in regard to my Internet campaign I sent to them last night. I am looking forward for your supports and guidance in this cause, not only for my self, but to make Canada a trust worthy, respectable nation in the world as we should be.